Yes, it's cool. People who think that pi's cooler than e don't understand this stuff. Sure, it's "just" Taylor's series, but in introductory calculus we don't usually get taught it in terms of differential operators; this formula is probably the primary motivation for writing operators for higher derivatives in exponential form. Deriving this for yourself is a great way to understand and remember it. So there's no need to feel embarrassed. I find most people enjoy E more than pie. This is something that's been puzzling me for a few months, and I thought I'd toss it your way. *20. Derive the Law of Cosines from the Law of Sines. *21. Derive the Law of Sines from the Law of Cosines. This fascinated me, because in all my research and Google-fu, I've never seen approaches to either theorem from this direction. But I've been confounded as to how the details of this proof would be worked out. Does anyone have any ideas? I'd expect 20 to start with squaring the sine rule, and then a wall of algebra more tedious than anyone can imagine. Or, perhaps you want to start with one triangle, and then put another triangle next to it, with the sum of two of the angles being pi/2. 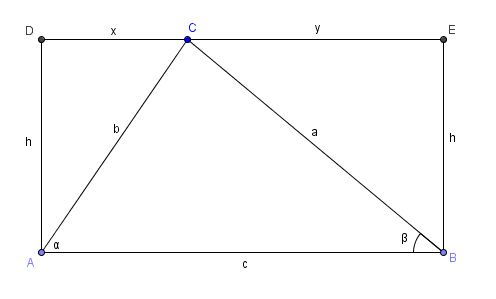 Then, cos of one angle is sine of the other. I started with the other one, taking the Law of Cosines in terms of two of the angles, adding them together, and then a wall of algebra more tedious than anyone could imagine to try to turn them into sines. It didn't lead to anything recognizable, but I don't know whether it was a failure of algebra at some step along the line. Now x²=b²+h²-2bh sinα = b²+h²-2abh(sinα/a) and y²=a²+h²-2ah sinβ=a²+h²-2abh(sinβ/b) since angle CAD is the complement of α and so on. This looked fruitful, but I couldn't think of how to combine x and y into a single equation in a manner that would be productive. Then I decided to ask for advice. If you think about the proof of the sine rule that starts with the formula for the area using sine (ie A = a*b*sin(C)/2), can we really imagine a proof arriving quicker via the cos rule? My "extra triangles" diagram had just one extra, and the two fitting inside a large right triangle. I doubt that's profitable, yours looks better. jestingrabbit wrote: If you think about the proof of the sine rule that starts with the formula for the area using sine (ie A = a*b*sin(C)/2), can we really imagine a proof arriving quicker via the cos rule? Yeah, it struck me in a "oh, duh" moment that I'm right at the doorstep. For the two equation, collect all the non-trig terms over to the left side and add in the Pythagorean theorem and you have 2h² = 2abh(sinα/a) and 2h² = 2abh(sinβ/b). And that would work equally well if ABC was obtuse, since we're not combining x and y. Pretty cool, that's a very different tactic than anything I'd seen up to this point. ETA: Argh, no it isn't. It's just the traditional proof that sinα = h/b and sinβ = h/a, made more complex out of a desire to derive it from the LoC. I had a feeling that would be the case. I'm a lot less sanguine about the converse, using an identity about two angles and turning into one about one angle. Maybe start with the law of sines in terms of angles A and B and then deriving the law of cosines relative to angle C, the supplement of the sum of the two angles? But I'd be thrilled if there was a proof that is as direct as the derivation of the Law of Sines we just thought up. The (Extended) Law of Sines tells us that a/sinA = b/sinB = c/sinC = 2R, where R is the circumradius, so we get that a = 2R sinA, b = 2RsinB, and c = 2RsinC. We want to establish the Law of Cosines, i.e. that c^2 = a^2 + b^2 - 2abcosC; using the substitutions and dividing through by 4R^2, we want to establish that sin^2 C = sin^2 A + sin^2 B - 2 sinA sinB cosC. (The Extended Law of Sines isn't strictly necessary here: whatever constant a/sinA = b/sinB = c/sinC happens to be, we just end up dividing through by that constant squared.) Now, C = 180 - A - B, so sinC = sin(A+B) = sinAcosB + cosA sinB and cosC = -cos(A+B) = sinA sinB - cosA cosB, so we want that (sinA cosB + cosA sinB)^2 = sin^2 A + sin^2 B - 2 sinA sinB (sinA sinB - cosA cosB). Expanding yields sin^2 A cos^2 B + cos^2 A sin^2 B + 2 sinA sinB cosA cosB = sin^2 A + sin^2 B + 2 sinA sinB cosA cosB - 2 sin^2 A sin^2 B. Canceling and a slight rearrangement gives us sin^2 A cos^2 B + sin^2 B cos^2 A = sin^2 A - sin^2 A sin^2 B + sin^2 B - sin^2 A sin^2 B, which is true by the Pythagorean Identity. Thanks, skeptical scientist, for knowing symbols and giving them to me. Not as hideous a wall of algebra as I'd thought. My initial google of the matter revealed a presentation in which the spherical version of one was derived from the spherical version of the other, and the slide containing the derivation was pretty scary (and not terribly well formatted) which wasn't very inspiring. I did gave a quick attempt at forcing the algebra, but as I did it in the confines of an unposted post rather than on paper, it was probably inevitably that I screwed it up somewhere. I haven't squinted too closely at the above solutions, but at a glance it seems like basically two separate approaches to the derivation in each direction. Is there any reason why one couldn't just do the derivation one way, and then just do the opposite steps for the derivation in the other direction? Dopefish wrote: Is there any reason why one couldn't just do the derivation one way, and then just do the opposite steps for the derivation in the other direction? Well, my argument for "Sines implies Cosines" uses the Law of Sines but doesn't start from it, and my argument for "Cosines implies Sines" starts from (the three versions of) the Law of Cosines but drops a lot of information in the last step. Neither one reverses nicely at all. The proof that sin²C = sin²A + sin²B - 2 sin A sin B cos C in a triangle "only" uses the fact that C = 180-A-B, the sum and difference identities for sine and cosine, and the Pythagorean identity. So, in theory, if you could show that all solutions to that equation have the same proportion, then you'd have proved the LoS from the LoC. Not that it matters much in that direction, there are far more elegant proofs of LoS than this one could be. Numerical Solutions of Differential Equations wrote: The course will address modern algorithms for the solution of ordinary and partial differential equations, inclusive of finite difference and finite element methods, as well as broad mathematical principles underlying their analysis. Well, that depends on how you like math / physics, and within math, math "methods." I'd always pick QFT or MHD and just do a numerical project for one or the other. Methods classes on their own sound very boring to me. Numerical methods certainly are quite useful, but useful *for* something. Hmm, that is the impression I was getting from a couple of other people too, that numerical stuff is better to pick up as and when you need it. In that case I'd probably be most interested in either the classical or quantum field theory courses. Classical field theory: Supposed to be taken concurrently with GR and electrodynamics (I'll be doing GR and maybe electrodynamics myself) and after seeing basic lagrangian/hamiltonian particle mechanics, mostly covers more advanced things like the lagrangian and hamiltonian approaches to field theories, Noether's theorem and so on. Quantum field theory: Only formal requirement is "an advanced course on quantum mechanics". Now, I've officially only done one QM course (out of three before QFT at my uni) but have been working through a book over the summer which covers everything up to basic QFT anyway. And it really doesn't look like you need that much. This is the one I'd be more interested in, but also the one which I'd probably find a bit harder. The meaning of "outer product" is clearly different. If ab is a scalar, then a∧b = ½(ab − ba) is also a scalar. But their ab is not a scalar. Eebster the Great wrote: The meaning of "outer product" is clearly different. If ab is a scalar, then a∧b = ½(ab − ba) is also a scalar. Their ab is not a scalar. According to the definition of geometric product they give, the geometric product of two vectors (ai + bj)(ci + dj) (a,b,c,d real scalars; i,j the basis on the space) is ac + bd + acij + bdij: ac + bd is clearly a scalar and acij + bdij is equal to (ac + bd)ij, which is a bivector. The scalar is the inner product and the bivector is the outer product. Uh, so ab is a scalar only if a = b, or a2 ≠ aa ? The a^2 would be ambiguous; do you mean a dot a, a wedge a, or their geometric product aa? It seems like a cute program, but there's trouble with generalizing it to arbitrary dimension and metric. I mean the geometric product. According to that page, a2 is a scalar. But the geometric product ab for a ≠ b must not be a scalar, because if it were, a∧b = ½(ab − ba) would clearly be a scalar too. Last edited by Eebster the Great on Sun Sep 21, 2014 11:35 pm UTC, edited 1 time in total. As long as we're working in two dimensions, their "outer product" is still a scalar. They're calling it a "bivector", but it's still just a number. They say it has "direction" in the article, but really it only has two directions: clockwise and anticlockwise, which map to positive and negative. Adding it to the dot product isn't necessarily something it makes sense to do, but it's not a type error like adding a scalar and a vector is... it's like, in 3D, adding a vector and a pseudovector... "a + a×b"... the types are compatible, the answer is just usually meaningless. Their "bivector" is basically the 2D equivalent of what the pseudovector is in 3D. The problem remains to assign geometric meaning to the quantity ab without expanding it into inner and outer products. Well... yeah. You'd think that'd be the first thing you do. Y'know, before you go around calling it a "geometric product" and all. Eebster the Great wrote: I mean the geometric product. According to that page, a2 is a scalar. But the geometric product ab for a ≠ b must not be a scalar, because if it were, a∧b = ½(ab − ba) would clearly be a scalar too. Their product lives in the exterior algebra of the vector space (or whatever the word for the algebra of 0-vectors, 1-vectors, 2-vectors, etc. is); so the product could, depending on circumstance, take a value as either a scalar, or a formal sum of scalars, vectors, bivectors (and more in higher dimension, but not on the plane). Since the wedge product a∧a is 0, in the case of aa, only scalars are present, so you can identify that with the scalar ||a||2. In particular, ab is a scalar exactly when a and b are parallel. (I have to say that that definition really threw me for the same reasons; it's just bad writing, really - a scalar is not the same as a formal sum involving 1). phlip wrote: As long as we're working in two dimensions, their "outer product" is still a scalar. They're calling it a "bivector", but it's still just a number. They say it has "direction" in the article, but really it only has two directions: clockwise and anticlockwise, which map to positive and negative. Adding it to the dot product isn't necessarily something it makes sense to do, but it's not a type error like adding a scalar and a vector is... it's like, in 3D, adding a vector and a pseudovector... "a + a×b"... the types are compatible, the answer is just usually meaningless. Their "bivector" is basically the 2D equivalent of what the pseudovector is in 3D. Just because the space of bivectors is only one dimensional doesn't mean it's just a number, unless you a particular basis in mind (which we don't). And they manage to show a sum of a scalar and bivector means something (a combination of a rotation & scaling) - which is reasonable enough. The problem is that, they seem to implicitly assume that the algebra operators on any formal sum of a scalar, vector, and bivector. However, by taking the geometric product of an even number of vectors, you always get the sum of a bivector and scalar, and of an odd number of vectors yields a vector. So, it's reasonable to say that the system actually discusses two different domains - that of rotation/scaling transformation (bivector + scalar) and that of vectors. Obviously, transformations are composed when multiplied, and a transformation * a vector is the application of the transformation to the vector, but a vector * transformation is the conjugate of the transformation applied to the vector (i.e. the rotation the other way) - which is just how a particular subgroup of matrices work. (Also, the product on the space of transformations is actually the complex numbers with multiplication; they point the similarity out, but somehow don't seem to make the connection that they're isomorphic). The only particularly interesting thing is that ba is the transformation which takes a to b|a| (when premultiplied). Mathematical hangover (n.): The feeling one gets in the morning when they realize that that short, elementary proof of the Riemann hypothesis that they came up with at midnight the night before is, in fact, nonsense. Moole wrote: Just because the space of bivectors is only one dimensional doesn't mean it's just a number, unless you a particular basis in mind (which we don't). I guess so... I was kinda assuming that there's a particular area that can be called "1", but I guess that isn't necessarily the case. Moole wrote: And they manage to show a sum of a scalar and bivector means something (a combination of a rotation & scaling) - which is reasonable enough. The first bit of this page is relevant (especially when it talks about its idea of "rotors"). I suppose they don't outright state it, but from knowing that iv = -vi is a rotation of v by a right angle, it's easy enough to see that that any value of the form (xi+y)v represents a rotation and scaling of v.
Yeah, the GA program is just a sort of anti Goldilocks. It seems a bit too sophisticated for the high school level intros, and then once it's serious math time you are much better off with differential forms. Here are a couple of cute things I encountered earlier this year, but I forgot to put them here. 1000000000000066600000000000001. Note that there are 13 zeroes either side of the 666, and the total number of digits in Belphegor's prime is 31, which is 13 reversed. I'm not usually interested in base-dependant properties of numbers, considering them somewhat numerological, but that one's just too cute. A schizophrenic number (also known as mock rational number) is an irrational number that displays certain characteristics of rational numbers. 222222222 1863492016791180833081844 . . . . The repeating strings become progressively shorter and the scrabbled strings become larger until eventually the repeating strings disappear. However, by increasing n we can forestall the disappearance of the repeating strings as long as we like. The repeating digits are always 1, 5, 6, 2, 4, 9, 6, 3, 9, 2, . . . . If you have a sphere, then you can do a stereographic projection in the usual way. Equivalently, you can place the sphere at the focus of a reflective paraboloid of revolution, project it, bounce it off the paraboloid, and catch the light at a plane at infinity... if you see what I mean. A rewrite of Euclid's elements from 1847 where colour is used to indicate variable names. where h is a constant and D is the differential operator, and Dnf is interpreted as the nth derivative of the function f evaluated at x. As someone who has never taken a course on real or complex analysis (other than vanilla calculus), I just thought this was really cool to discover on my own! I distinctly remember seeing this a few days ago being called the <name>ian Identity, and I am somewhat sure it was Lagrange, but Lagrangian Identity seems to return something else. Ah well. where hi is the Complete Homogeneous Symmetric Polynomial of order i. Are there nice, "symmetrical" arrangements of resistors that have other h-ratios? h2/h1 = (ab + bc + ca)/(a+b+c)? Maybe Hamilton? In quantum mechanics, the differential operator you use is the Hamiltonian, and that is how you get time evolution. It is a big deal. Nice catch. If I understand you correctly, you are refering to the Taylor series. Be warned, though, there are functions for which the Taylor series does not equal the original function. Ah well, I guess it doesn't really matter. I think you're talking about a Bernoulli flow. They're covered by Ornstein's Theorem. where the progress is more modular ie one gets little buttons that do previous tasks (like bisect, or form a perpendicular etc) that ends with drawing a line tangent to two circles. I think you're talking about Euclid: The Game. Xenomortis wrote: O(n2) takes on new meaning when trying to find pairs of socks in the morning. You are correct. Thank you so much! eta: its been spruced up a lot since I was last there, much better than it was.